There are more than 46.8 million people living with dementia around the world. It is predicted that this number will double every 20 years and reach over 130 million by 2050! Sourced from Prince, Martin et al. 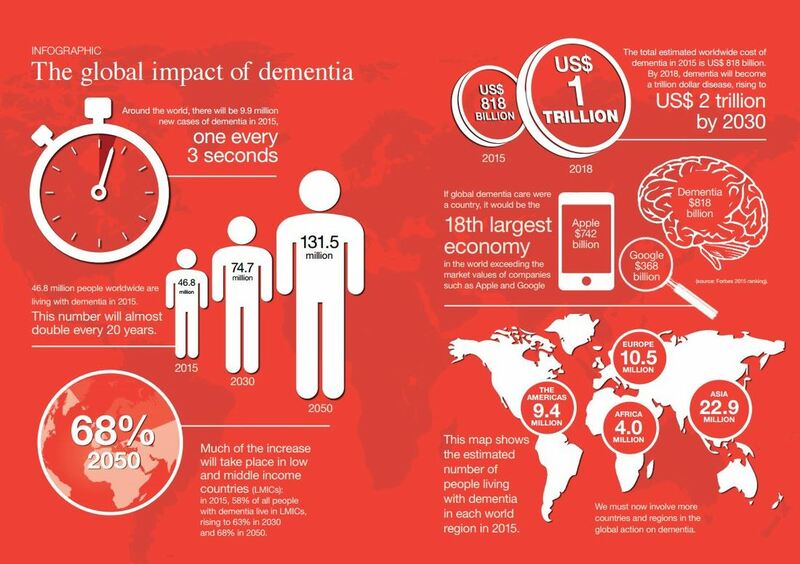 World Alzheimer Report 2015: The Global Impact Of Dementia. London: Alzheimer’s Disease International, 2015. The most common types of dementia are Alzheimer’s disease and vascular dementia. Together, they account for over 80% of dementia cases. Currently, there is no prevention or cure for dementia. However, there are available medicines that reduce the progression of symptoms. In addition to finding a cure for dementia, researchers are looking at ways to delay or prevent this disease. For example, dementia could be delayed by changing lifestyle behaviours such as what we eat and how much exercise we do. As dementia mostly occurs after the age of 65, delaying dementia by as little as 2 years could reduce the number of affected people by up to 20%! Dementia is normally caused by a number of factors including genetic and lifestyle factors. As a result, trials that target more than one cause of dementia are arguably more likely to delay or prevent dementia. And this is what Maintain Your Brain is all about! Maintain Your Brain will be a world first to change various lifestyle behaviours using the internet to reduce risk of future dementia. Maintain Your Brain will be completed online through the computer, which means participants can participate in the comfort of their own home and at a time that suits them.